During the second quarter of the nineteenth century, the industrial and commercial development of the Borough of Norfolk had still not reached the vicinity of the fort. Vastly different from its setting today, Fort Norfolk in the 1840s was surrounded by pine thickets to the north and grasslands to the east. In December 1842, the U.S. Navy made its first request for the use of Fort Norfolk. Commodore Kennedy, the commander of the U.S. Navy Yard at Gosport petitioned the War Department for permission to use Fort Norfolk "for the purpose of repairing boats and exercising Marines." It is not certain to what extent Commodore Kennedy made use of the fort. The fact that the buildings were reported to be in generally poor condition only a few years later indicates that the Navy made no major repairs. In 1844, W. P. S. Sanger of the U.S. Army Corps of Engineers prepared a plan of the abandoned fort on which he labeled the buildings (Sanger 1844) (see above). Sanger located the "shot oven” in the northwestern comer of the fort and a well inside the northeast bastion near the old magazine. Sanger’s depiction of the "edge” of a bank on the south side of the fort probably indicates that the glacis was badly eroded. 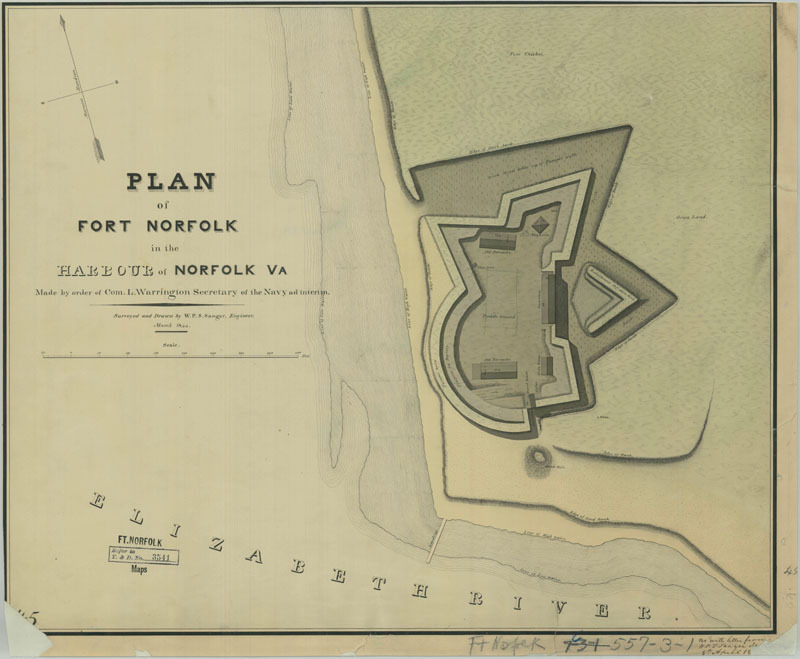 As the inscription on the plan indicates, the 1844 survey of Fort Norfolk was conducted at the request of the Secretary of the Navy. By the end of the decade, the Navy obtained the use of Fort Norfolk for a powder storage facility. Additional markings on the 1844 plat show that it was used by Navy officials in planning the construction of the magazine. The rectangle sketched on the fort's parade ground identifies the spot where the powder magazine was eventually built during the 1850s and where it still stands today. One can also see where the plat was updated by having the word "old" written to the denote the former army magazine (Sanger 1844) (see above).